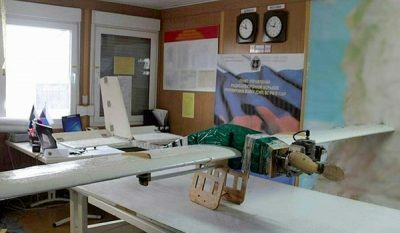 Over 200 drones have been sent from Turkey to two regions controlled by Tahrir al-Sham Hay’at (the Levant Liberation Board or the Al-Nusra Front) terrorists in preparation for the upcoming war against the Syrian Army in Idlib, a Russian media outlet reported on Saturday. The Arabic-language website of Sputnik reported [yet to be confirmed] that large trucks, carrying more than 200 drones, left the town of Sarmada in Northern Idlib for a Tahrir al-Sham base in al-Mohandesin neighborhood in Idlib city. It further said that the drones were brought to Syria from Turkey, adding that five Turkish and two Chechen experts are in Tahrir al-Sham base, checking the drones to be later sent to Jisr al-Shughour in Western Idlib and a region in Northern Hama. The Russian air defense at Humeimim airbase in Western Syria and the Syrian army have shot down tens of drones in recent months. The Syrian army has also targeted a number of combat and spying drones of the terrorists in Northern Hama in the last few days. Field sources reported on Thursday that the Turkish army dispatched a military convoy, consisting of 15 military vehicles to Northern Syria through Kafr Lousin passageway. They added that the convoy also included truckloads of Turkish army soldiers and officers and building blocks transferred to the Turkey-occupied region in the town of Morek. According to the report, also another military convoy of the Turkish army, which included several military vehicles, was sent to the town of al-Sarman in Eastern Idlib. The developments came as the Syrian army is preparing for a major fight in Idlib and is sending large volume of military equipment to its positions.